This summer we surveyed the public libraries of Ontario to get an idea of how they’re dealing with the demand for digitizing their special and unique heritage collections. We got a response from 55% of all Ontario public and First Nations libraries, and the libraries that responded cover almost 90% of the total Ontario population served by libraries (which is itself 90% of the total population, so, about 86% of us). We’re delighted to have such a strong response and can’t wait to share all the results with you. We asked about 80 questions, so there’s a lot to cover! Today we just want to share a few facts – a preview of our upcoming report release in January 2019. You can download the one-page print PDF here, or save and share the web-ready PNG here. This infographic is copyright OurDigitalWorld and Creative-Commons-licensed CC-BY-NC-SA 4.0. That means you can share and remix it, with attribution, for non-commercial purposes only, and if you make any derivative versions, you must share them with the same license. 76% of the responding Ontario public libraries have special collections of some kind. More than half are currently accepting special collections, and 13% are considering it. 13% did once, but don’t anymore. 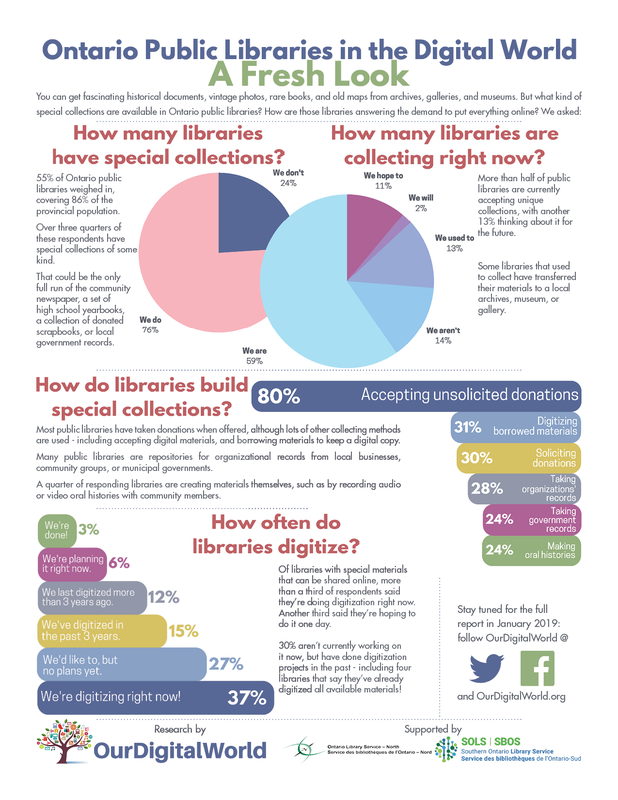 80% of libraries with special collections have accepted unsolicited donations, 31% have added materials by digitizing borrowed items, 30% have solicited materials, and 28% have collected records from community groups and local organizations. A third of responding libraries have an active digitization program; another third would like to do it one day, whether they have concrete plans or not. 27% said they weren’t currently working on anything but had done digitization in the past, and four libraries (3%) said they had completed all digitization of their heritage materials! Our thanks to SOLS and OLS-N for supporting this work. Stay tuned for more results, discussion, and recommendations of ways to get Ontario’s heritage online and available for everyone to use. Follow us on Twitter or Facebook, or sign up for our newsletter!